31 Days of Horror - Day 27 "Halloween: The Curse of Michael Myers (Producer's Cut)"
It's crazy that I've finally seen this movie. I used to be a regular at the horror forums at Joblo.com during my teens and this film always came up in discussion. Bootleg versions of the Producer's Cut were always being talked about, especially how superior they were to the theatrical. This was easy to believe given the shittiness of the first, but I never managed to get a copy. Thankfully, executives have seen the money in releasing a legitimate copy, so I've finally been able to see it. And in HD no less! I'm so glad that this film lived up to expectations. Sure, it's not some amazing film, but it's actually competent, which is a nice change. 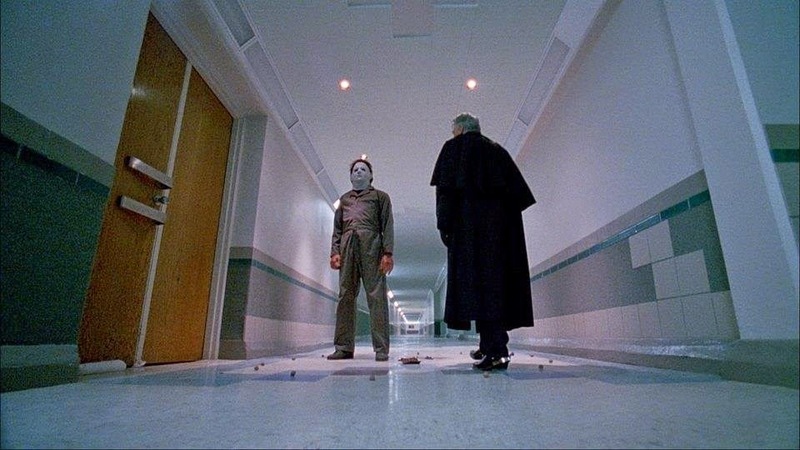 The Halloween series is so hit or miss, it's nice to see one of the lesser films be given a better treatment. There's a lot less gore in this cut, which you think would be a problem, but I actually preferred it. The death's that remain are still creative enough, whereas the gorier ones were a tad exploitative anyhow. The entire film seems much more coherent and like an actual horror film. Only a few days ago, I had watched the theatrical cut again since it was on Netflix. I couldn't believe how much I disliked it. Everything about it just screamed troubled production. And after years of disliking the Thorn cult on paper, I actually really enjoyed it, put to action. It added a layer to Michael that I didn't mind -- especially after seeing Zombie's terrible attempt at an origin story. I'm glad that I was finally able to see it, especially since it may have swayed me a little more with the Halloween series. Or maybe I'm just talking crazy. Yeah, probably that. 31 Days of Horror - Day 30 "Halloween"
31 Days of Halloween - Day 29 "Saw II"
31 Days of Horror - Day 28 "Trick R Treat"
31 Days of Horror - Day 26 "Halloween II"
31 Days of Horror - Day 24 "Halloween '07"
31 Days of Horror - Day 22 "28 Weeks Later"
31 Days of Horror - Day 20 "Hocus Pocus"
31 Days of Horror - Day 19 "Maniac Cop 3"
31 Days of Horror - Day 18 "Maniac Cop 2"
31 Days of Horror - Day 16 "Candyman"
31 Days of Horror - Day 15 "Venom"
31 Days of Horror - Day 14 "Maniac"
31 Days of Horror - Day 13 "Re-Animator"
31 Days of Horror - Day 11 "Dead Alive"
31 Days of Horror - Day 10 "The Shining"
31 Days of Horror - Day 7 "Hellraiser Bloodline"
31 Days of Horror - Day 5 "Housebound"
31 Days of Horror - Day 4 "The Burning"
31 Days of Horror - Day 3 "Cabin in the Woods"
31 Days of Horror - Day 2 "Cursed"
31 Days of Horror - Day 1 "Scream 4"